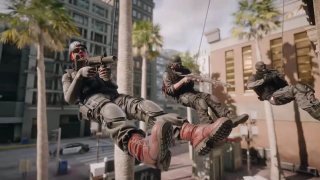 This trailer is designated "gameplay trailer fall", but it doesn't give much of an idea of what it's like to actually play Rainbow Six Siege (though I imagine most of you who care have got a sense of that from taking part in the beta). Instead, it's Ubisoft's vision for the kind of stories it wants players to tell through playing. It's more like a trailer for a movie or television drama, with wipe cuts and a narrative told through musical beats and camera zooms and slow motion and locations that reveal themselves one letter at a time. The hostage moans into her gag, the siegers breathe one-liners. There are lots of explosions. In theory, Rainbow Six Siege is the kind of game that will leave players with stories to tell their friends, of their perfectly executed master plan or that time everything went wrong but they managed to turn things around at the last minute. We'll find out if that's the case on December 1.